The word “quasar” refers to a “quasi-stellar radio source.” The first quasars were discovered in the 1960s when astronomers measured their very strong radio emissions. Later, scientists discovered that quasars are actually radio-quiet, with very little radio emission. However, quasars are some of the brightest and most distant objects we can see. These ultra-bright objects are likely the centers of active galaxies where supermassive black holes reside. As material spirals into the black holes, a large part of the mass is converted to energy. It is this energy that we see. And though smaller than our solar system, a single quasar can outshine an entire galaxy of a hundred billion stars. To date, astronomers have identified more than a thousand quasars. 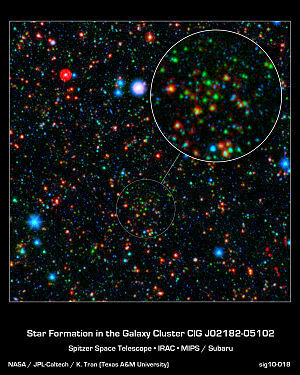 (Sen) – Astronomers observing ancient starburst galaxies have made a connection between them and the elliptical galaxies we see today. There are many different types of galaxies in the Universe and astronomers have long desired to join the dots and solve the puzzles of galaxy evolution. Looking at galaxies that are far, far away is also a way of looking back in time. Their light has taken billions of years to reach us, and thus we see those galaxies as they were billions of years ago. Galaxies in the ancient Universe are often very different than the host of spiral and elliptical galaxies that we are surrounded by today. For example, the extremely bright quasars are common in the distant Universe and yet none exist locally. However, astronomers using NASA’s Spitzer Space Telescope along with ESO’s Very Large Telescope and 12 metre Atacama Pathfinder Experiment (APEX) telescope have managed to see how distant submillimetre galaxies, quasars, and modern elliptical galaxies fit together in the jigsaw of the Universe. Sub~millimetre galaxies (SMGs) are situated 10 billion light years from us, and are extremely bright in the infrared region of the spectrum, specifically the submillimetre band. Because the SMGs are located so far away, the light emitted by the galaxies is shifted to much longer wavelengths. These galaxies are also starburst galaxies, meaning that for a short while there is a phenomenal rate of star formation. A supernova explosion would occur every few years and on a planet in a starburst galaxy the night sky would be almost as bright as day. Astronomers have been able to measure the mass of the dark matter halos surrounding a group of SMGs. Dark matter is invisible and we don’t know what it is, but indirect detections tells us that galaxies are usually engulfed in it. The dark matter typically extends far beyond the edge of the visible galaxy. But measuring the mass of dark matter halos 10 billion light years away is no easy task. Ryan Hickox, lead author of the paper on the subject, explains to Sen how this was done. Researchers have used advanced computer simulations to show that the space between galaxies is teeming with dark matter. Everything that we can see around us in the Universe only makes up around 4.5 per cent of the total mass of the Universe. The remaining “missing mass” is made up of dark matter and dark energy, and the origin of both of these is still a mystery. While dark matter cannot be directly detected, its presence can be inferred from an effect known as gravitational lensing. Light from a distant object, such as a quasar, is bent around a foreground galaxy so that the light from the quasar becomes distorted. The way in which the light is bent depends on the mass of the “lens” galaxy. The image on the left shows a simulation of how light from distant sources should appear if there is no intervening “lens,” while the image on the right shows how light can be distorted when there is a galaxy between us and the distant light sources. However the mass of galaxies is usually much greater than what is expected from looking at the amount of matter that is visible. 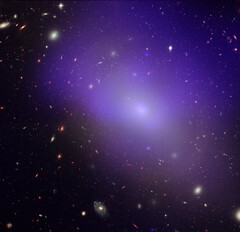 It has been known for some time that large dark matter halos exist around galaxies, which stretch up to 100 million light years from the centre of the galaxies. Astronomers have found a quasar that’s more than five times more powerful than any previously seen. Quasars are mega-bright geysers of matter and energy powered by super-massive black holes at the centers of young galaxies. Quasars are the brightest and most distant objects in the known universe. In the early 1960’s, quasars were referred to as radio stars because they were discovered to be a strong source of radio waves. In fact, the term quasar comes from the words, “quasi-stellar radio source”. Today, many astronomers refer to these objects as quasi-stellar objects, or QSOs. As the resolution of our radio and optical telescopes became better, it was noticed that these were not true stars but some type of as yet unknown star-like objects. It also appeared that the radio emissions were coming from a pair of lobes surrounding these faint star-like objects. It was also discovered that these objects were located well outside our own galaxy. Quasars are very mysterious objects. Astronomers today are still not sure exactly what these objects are. What we do know about them is that they emit enormous amounts of energy. They can burn with the energy of a trillion suns. Some quasars are believed to be producing 10 to 100 times more energy than our entire galaxy. All of this energy seems to be produced in an area not much bigger than our solar system. We do know that quasars are extremely distant. In fact, they may be the most distant objects in the universe. They also have the largest red shift of any other objects in the cosmos. Astronomers are able to measure speed and distance of far away objects by measuring the spectrum of their light. If the colors of this spectrum are shifted toward the red, this means that the object is moving away from us. The greater the red shift, the farther the object and the faster it is moving. Since quasars have such a high red shift, they are extremely far away and are moving away from us at extremely high speeds. It is believed that some quasars may be moving away from us at 240,000 kilometers per second or nearly 80% the speed of light. Quasars are, in fact, the most distant objects to ever be detected in the universe. We know that light travels a certain distance in a year. Quasars are so far away that the light we see when we observe them has been traveling for billions of years to reach us. This means that quasars are among the most ancient objects known in the universe. The most distant quasars observed so far are over 10 billion light-years away. This means we are seeing them as they appeared 10 billion years ago. It is entirely possible that some or all of the quasars we see today may not even exist any more. Peering back to the early Universe, Europe’s Very Large Telescope has found gas-filled galaxies that lacked the gravity dynamics to form stars. A long-sought faint fluorescent glow was detected, revealing these previously invisible objects. We still do not know exactly what a quasar is. But the most educated guess points to the possibility that quasars are produced by super massive black holes consuming matter in an acceleration disk. As the matter spins faster and faster, it heats up. The friction between all of the particles would give off enormous amounts of light other forms of radiation such as x-rays. The black hole would be devouring the equivalent mass of one Sun per year. As this matter is crushed out of existence by the black hole, enormous amounts of energy would be ejected along the black hole’s north and south poles. Astronomers refer to these formations as cosmic jets. Another possible explanation for quasars is that they are very young galaxies. 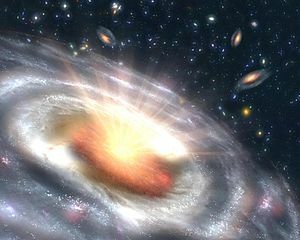 Since we know very little about the evolutionary process of galaxies, it is possible that quasars, as old as they are, represent a very early stage in the formation of galaxies. The energy we see may be ejected from the cores of these very young and very active galaxies. Some scientists even believe that quasars are distant points in space where new matter may be entering our universe. This would make them the opposite of black holes. But this is only conjecture. It may be some time before we really understand these strange objects. Pulsars are among the strangest objects in the universe. In 1967, at the Cambridge Observatory, Jocelyn Bell and Anthony Hewish were studying the stars when they stumbled on something quite extraordinary. It was a star-like object that seemed to be emitting quick pulses of radio waves. Radio sources had been known to exist in space for quite some time. But this was the first time anything had been observed to give off such quick pulses. They were as regular as clockwork, pulsing once every second. The signal was originally thought to be coming from an orbiting satellite, but that idea was quickly disproved. After several more of these objects had been found, they were named pulsars because of their rapidly pulsing nature. Bright pulsars have been observed at almost every wavelength of light. Some can actually be seen in visible light. Many people tend to get pulsars confused with quasars. But the two objects are totally different. Quasars are objects that produce enormous amounts of energy and may be the result of a massive black hole at the center of a young galaxy. But a pulsar is a different animal entirely. Astronomers know of only four “pulsar planets” so far, and much remains unknown about such worlds, but scientists propose that they formed in the chaos after the supernova explosions that gave birth to the pulsars. Excitement is riding high in the astronomical community with the recent discovery of Comet ISON, which is destined to pass exceedingly close to the sun in late November 2013 and might possibly become dazzlingly bright. The latest information issued by NASA’s Jet Propulsion Laboratory suggests that this comet could get as bright as magnitude -11.6 on the astronomers’ brightness scale; that’s as bright as nearly full moon! That would also be bright enough for Comet ISON to be visible during the daytime. Comets that are visible to the naked eye during the daytime are rare, but such cases are not unique. In the last 332 years, it has happened only nine other times. Here is a listing of past comets that have achieved this amazing feat. Great Comet of 1680 —This comet has an orbit strikingly similar to Comet ISON, begging the question of whether both objects are one and the same or at the very least are somehow related. Discovered on Nov. 14, 1680 by German astronomer Gottfried Kirsch, this was the first telescopic comet discovery in history. By Dec. 4, the comet was visible at magnitude +2 with a tail 15 degrees long. On Dec. 18 it arrived at perihelion — its closest approach to the sun — at a distance of 744,000 miles (1.2 million kilometers). A report from Albany, N.Y. indicated that it could be glimpsed in daylight passing above the sun. In late December, it reappeared in the western evening sky, again of magnitude +2, and displaying a long tail that resembled a narrow beam of light that stretched for at least 70 degrees. The comet faded from naked-eye visibility by early February 1681. Great Comet of 1744 — First sighted on Nov. 29, 1743 as a dim 4th-magnitude object, this comet brightened rapidly as it approached the sun. Many textbooks often cite Philippe Loys de Cheseaux, of Lausanne, Switzerland as the discoverer, although his first sighting did not come until two weeks later. By mid-January 1744, the comet was described as 1st-magnitude with a 7-degree tail. By Feb. 1 it rivaled the star Sirius in brightness and displayed a curved tail 15 degrees in length. By Feb. 18 the comet was as bright as Venus and now displayed two tails. On Feb. 27, it peaked at magnitude -7 and was reported visible in the daytime, 12 degrees from the sun. Perihelion came on March 1, at a distance of 20.5 million miles (33 million km) from the sun. On March 6, the comet appeared in the morning sky, accompanied by six brilliant tails that resembled a Japanese hand fan. Great Comet of 1843 — This comet was a member of the Kruetz Sungrazing Comet Group, which has produced some of the most brilliant comets in recorded history. Such comets actually graze through the outer atmosphere of the sun, and often do not survive. The 1843 comet passed only 126,000 miles (203,000 km) from the sun’s photosphere on Feb 27, 1843. Although a few observations suggest that it was seen for a few weeks prior to this date, on the day when of its closest approach to the sun it was widely observed in full daylight. Positioned only 1 degree from the sun, this comet appeared as “an elongated white cloud” possessing a brilliant nucleus and a tail about 1 degree in length. Passengers onboard the ship Owen Glendower, off the Cape of Good Hope described it as a “short, dagger-like object” that closely followed the sun toward the western horizon. In the days that followed, as the comet moved away from the sun, it diminished in brightness but its tail grew enormously, eventually attaining a length of 200 million miles (320 million km). If you were able to place the head of this comet at the sun’s position, the tail would have extended beyond the orbit of the planet Mars! Great September Comet of 1882 — This comet is perhaps the brightest comet that has ever been seen; a gigantic member of the Kreutz Sungrazing Group. First spotted as a bright zero-magnitude object by a group of Italian sailors in the Southern Hemisphere on Sept.1, this comet brightened dramatically as it approached its rendezvous with the sun. By Sept. 14, it became visible in broad daylight and when it arrived at perihelion on the 17th, it passed at a distance of only 264,000 miles (425,000 km) from the sun’s surface. On that day, some observers described the comet’s silvery radiance as scarcely fainter than the limb of the sun, suggesting a magnitude somewhere between -15 and -20! The following day, observers in Cordoba, Spain described the comet as a “blazing star” near the sun. The nucleus also broke into at least four separate parts. In the days and weeks that followed, the comet became visible in the morning sky as an immense object sporting a brilliant tail. Today, some comet historians consider it as a “Super Comet,” far above the run of even Great Comets. Great January Comet of 1910 — The first people to see this comet — then already at first magnitude — were workmen at the Transvaal Premier Diamond Mine in South Africa on Jan. 13, 1910. Two days later, three men at a railway station in nearby Kopjes casually watched the object for 20 minutes before sunrise, assuming that it was Halley’s Comet. Later that morning, the editor of the local Johannesburg newspaper telephoned the Transvaal Observatory for a comment. The observatory’s director, Robert Innes, must have initially thought this sighting was a mistake, since Halley’s Comet was not in that part of the sky and nowhere near as conspicuous. Innes looked for the comet the following morning, but clouds thwarted his view. However, on the morning of Jan. 17, he and an assistant saw the comet, shining sedately on the horizon just above where the sun was about to rise. Later, at midday, Innes viewed it as a snowy-white object, brighter than Venus, several degrees from the sun. He sent out a telegram alerting the world to expect “Drake’s Comet” — for so “Great Comet” sounded to the telegraph operator. Comet Skjellerup-Maristanny, 1927 —Another brilliant comet, first seen as a 3rd magnitude object in early December 1927, had the unfortunate distinction of arriving under the poorest observing circumstances possible. The orbital geometry was such that the approaching comet could not be seen in a dark sky at any time from either the Northern or the Southern Hemisphere. Nonetheless, the comet reached tremendous magnitude at perihelion on Dec. 18. Located at a distance of 16.7 million miles (26.9 million km) from the sun, it was visible in daylight about 5 degrees from the sun at a magnitude of -6. As the comet moved out of the twilight and headed south into darker skies, it faded rapidly, but still threw off an impressively long tail that reached up to 40 degrees in length by the end of the month. This painting of Comet Ikeya-Seki, visible during the day, was done by now-retired Hayden Planetarium artist Helmut K. Wimmer and was based on a description made by Hayden’s Chief Astronomer, Ken Franklin, from an airplane hovering over West Point, New York. It was originally published in the February 1966 issue of Natural History magazine. Republished with permission. Comet Ikeya-Seki, 1965 — This was the brightest comet of the 20th century, and was found just over a month before it made perihelion passage in the morning sky, moving rapidly toward the sun. Like the Great Comets of 1843 and 1882, Ikeya-Seki was a Kreutz Sungrazer, and on Oct. 21, 1965, it swept within 744,000 miles (1.2 million km) of the center of the sun. The comet was then visible as a brilliant object within a degree or two of the sun, and wherever the sky was clear, the comet could be seen by observers merely by blocking out the sun with their hands. From Japan, the homeland of the observers who discovered it, Ikeya-Seki was described as appearing “ten times brighter than the full moon,” corresponding to a magnitude of -15. Also at that time, the comet’s nucleus was observed to break into two or three pieces. Thereafter, the comet moved away in full retreat from the sun, its head fading very rapidly but its slender, twisted tail reaching out into space for up to 75 million miles (120 million km), and dominating the eastern morning sky right on through the month of November. Comet West, 1976 — This comet developed into a beautiful object in the morning sky of early March 1976 for Northern Hemisphere observers. It was discovered in November 1975 by Danish astronomer Richard West in photographs taken at the European Southern Observatory in Chile. Seventeen hours after passing within 18.3 million miles (29.5 million km) of the sun on Feb. 25, 1976, it was glimpsed with the naked eye 10 minutes before sunset by John Bortle. In the days that followed, Comet West displayed a brilliant head and a long, strongly structured tail that resembled “a fantastic fountain of light.” Sadly, having been “burned” by the poor performance of Comet Kohoutek two years earlier, the mainstream media all but ignored Comet West, so most people unfortunately failed to see its dazzling performance. Michael Jager and Gerald Rhemann photographed comet C/2006 P1 (McNaught) from Austria in twilight 45 minutes before sunrise on Jan. 3. Rhemann told SPACE.com they used 7×50 binoculars to find the comet. They estimate that today (Jan. 5) it shone at magnitude +1 and they expect to see it with the naked eye next week. Comet McNaught, 2007 —Discovered in August 2006 by astronomer Robert McNaught at Australia’s Siding Spring Observatory, this comet evolved into a brilliant object as it swept past the sun on Jan. 12, 2007 at a distance of just 15.9 million miles (25.6 million km). According to reports received from a worldwide audience at the International Comet Quarterly, it appears that the comet reached peak brightness on Sunday, Jan. 14 at around 12 hours UT (7:00 a.m. EST, or 1200 GMT). At that time, the comet was shining at magnitude 5.1. After passing the sun, Comet McNaught developed a stupendously large, fan-shaped tail somewhat reminiscent of the Great Comet of 1744. Unfortunately for Northern Hemisphere observers, the best views of Comet McNaught were mainly from south of the equator. Joe Rao serves as an instructor and guest lecturer at New York’s Hayden Planetarium. He writes about astronomy for The New York Times and other publications, and he is also an on-camera meteorologist for News 12 Westchester, New York. This entry was posted in Astronomy, Galaxy, Images, Photography, Sen dot Com, Star and tagged Astrophotography, Constellations, Photos, Pulsars, Quasar, Quasars, Stars, Vega. Bookmark the permalink.